It seems lately my preferred choice is the darks, charcoal and Indian ink in particular. I have fallen for this sleek liquid, I could paint a whole page black with it and I would enjoy the moment? Weird, but I like the way it applies, either with a dip pen or brush, for the moment it is brush that gets the thumbs up. Thought I should add some colour for this owl, which I applied first, before the dense blackness crept in. This entry was posted in art, colourful, indian ink, Owl, watercolour and tagged art, colourful, indian ink, Owl, painting, Painting, watercolour. Bookmark the permalink. 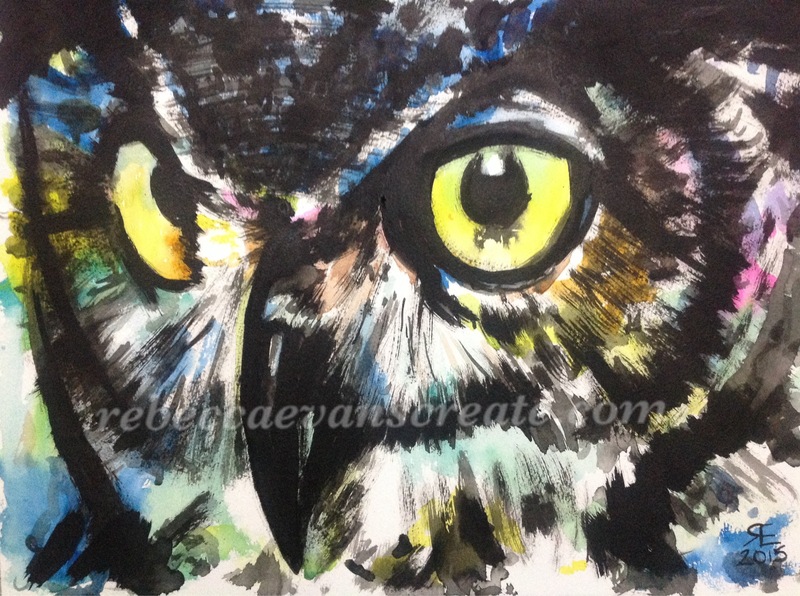 Stunning owl Rebecca – superb plumage and the layering over colours gives it a suitably mystical/dark feel. They are magical creatures!